Generally speaking, metrics are used to understand the current situation better as well as to gain insight on change over time. Without metrics, assessing any effort or development will be open to gut feeling and bias based interpretation. The first rule of tracking meaningful metrics is only to track those that apply to the team. Ignore those that measure the individual. The second rule of tracking metrics is not to measure parameters just because they are easy to follow. This practices often is a consequence of using various agile tools that offer out-of-the-box reports. The third rule of tracking metrics is to record context as well. Data without context, for example, the number of the available team member, or the intensity of incidents during a sprint, maybe turn out to be nothing more than noise. May have deliberately built some temporary solution to speed up experimentation. If you like to track a team’s progress in adopting agile techniques and processes, self-assessment tests are well-suited for that purpose. For example, I like to use the Scrum Checklist by Henrik Kniberg. Orange: It worked for the team but there was room for improvement. Red: It either didn’t apply, for example the team wasn’t using burn down charts, or the practice was still failing. If the resulting Scrum practices map is getting greener over time, the team is on the right track. Otherwise, you have to dig deeper to understand the reasons why there is no continuous improvement, and adapt accordingly. The poll takes less than 30 seconds of each team member’s time, and the results are of course available to everyone. Again, tracking the development of the three qualitative metrics provides insight into trends that otherwise might go unnoticed. Ultimately, the purpose of any agile transition is to become a learning organization, thus gaining a competitive advantage over the competition. The following metrics apply to the (software) product delivery process but can be adapted to various other processes accordingly. In the long run, this will not only require to restructure the organization from functional silos to more or less cross-functional teams, where applicable. It will also require analyzing the system itself, for example, to figure out where queues impede value creation. The date when a previously validated idea, for example, a user story for a new feature, becomes a product backlog item. The date when this product backlog item becomes a sprint backlog item. The date when development starts on this sprint backlog item. The date when the sprint backlog item meets the team’s ‘Definition of Done’. The date when the sprint backlog item is released to customers. The lead time is the time elapsed between first and the fifth date, the cycle time the time elapsed between third and the fourth date. The objective is to reduce both lead time and cycle time to improve the organization’s capability to deliver value to customers. The purpose is accomplished by eliminating dependencies and hand-overs between teams within the product delivery process. Furthering a whole-product perspective, and systems thinking among all team members. 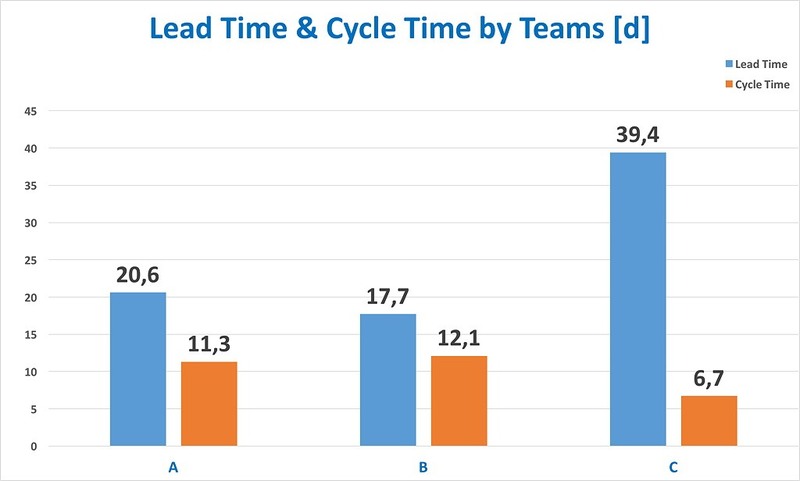 Measuring lead time and cycle time does not require a fancy agile tool or business intelligence software. A simple spreadsheet will do if all teams stick to a simple rule: note the date once you move a ticket. The method even works with index cards. Esther Derby suggests in her article Metrics for Agile to also measure the ratio of fixing work to feature work, and the number of defects escaping to production. A bad, yet traditional agile metric is team velocity. Team velocity is a notoriously volatile metric, and hence actually only usable by the team itself. The team had to deal with serious bugs. To make things worse, you cannot compare velocities between different teams since all of them are estimating differently. This practice is acceptable, of course, as estimates are usually not pursued merely for reporting purposes. Estimates are a no more than a side-effect of the attempt to create a shared understanding among team members on the why, how, and what of a user story. So, don’t use velocity as an agile metric. Read more on velocity here: Scrum: The Obsession with Commitment Matching Velocity. The ugliest agile metric I have encountered so far is ‘story points per developer per time interval’. This metric equals ‘lines of code’ or ‘hours spent’ from a traditional project reporting approach. The metric is completely useless, as it doesn’t provide any context for interpretation or comparison. Equally useless “agile metrics” are, for example, the number of certified team members, or the number of team members that accomplished workshops on agile practices. If you can only record a few data points, go with start and end dates to measure lead time and circle time. If you have just started your agile journey, you may consider also tracking the adoption rate of an individual team by measuring qualitative signals, for example, based on self-assessment tests like the ‘Scrum test’ by Henrik Kniberg. What do you measure to track your progress? Please share with us in the comments, or join our Slack team “Hands-on Agile”—we have a channel for agile metrics. It was a lot of helpfull tips. We use a relative value by defining the “highest value sprint” of the past and then comparing other sprints to that one. It is admittedly a bit fuzzy, but all three questions are supposed to be answered without much thinking. It takes usually less than 15 seconds to do so. What are your units of measure of “value”?